The first equestrian vaulting competition of the season was held at the Scottish National Equestrian Centre, Ecclesmachan last weekend. Wee County Vaulters participated in a variety of classes gaining many podium places. In the Senior 3* class Hannah Young was placed first vaulting on W.H.Bentley lunged by John Eccles. Rebecca Norval took second place on Tylers Kernel lunged by Amanad McLachlan with Hannah Young taking 3rd place on KCM Cantaro lunged by Anne Young. This was Cantaros first competition. In the Junior 2* class Lisa Mercer placed first on W.H.Bentley with Mitra Pezeshki taking 4th place on Tylers Kernel. Bryony Rawding also vaulted on Tylers Kernel in the Junior 1* class finishing in first position. In the child class, Kerri Brylka took 3rd place with Mhairi Hume 4th and Katie Henderson 5th all vaulting on Captain Jack lunged by John Eccles. Kerri and Bryony then competed together in the Pas de deux competition taking first place on W.H.Bentley. In the Pre Novice Individual class Ferne Smith was placed first and Sally Henderson 2nd vaulting on Tylers Kernel once again lunged by Amanda McLahlan. The girls also competed in the Walk Individual 9-12 years class with Sally taking 2nd place and Ferne 3rd. In the over 12 class Joanne Messner was placed first with Michelle Messner 2nd. The girls also took part in the Walk pas de deux taking 5th place. Finally in the squad walk class the Wee County Team of Joanne Mesner, Michelle Messner, Sally Henderson, Ferne Smith, Michaela Hogg, Rhona Swan and Eilidh Bennet were placed first in the restricted section with the Wee County Team of Lisa Mercer, Mitra Pezeshki, Bryony Rawding, Kerri Brylka, Mhairi Hume and Katie Henderson also taking first place in the open section. Thanks must go to all the parents and friends who helped with lunging and stewarding at the competition. 2015 was a busy year for our vaulters. We had competitiors in all 3 FEI classes at the Senior European Championships in Aachen alongside 4 of our horses. We competed at 4 CVIs throughout the year and completed the competitive year at the British Championships bringing home many of the titles including Senior Female individual, Senior Male individual, Child Female individual, Senior Pas de Deux and Senior team to name a few. Our year finished up with a display at the Horse of the Year Show. Our horses were brilliant and we presented 2 different routines with Warrior and Great Gatsby themes. Wee County Vaulters have had yet another very successful year, although we have had to overcome some challenges throughout the year. OUR HORSES --- Anton, as we all know, has not made the standard required although he did have numerous opportunities but is now happy as a ridden horse in the Borders. Tyke has had some shoeing issues which has meant that he has not always been available at high level competitions. Billy definitely proved himself by taking the squad at the European Championships and hopefully will improve further as his experience grows. Brock, as always, is a bedrock of our club training and although gaining in age is still a great asset to our club. Henry, again has pulled it out the bag, taking our club and GBR to international medal success. Jack, our newest horse member, hopefully will make the grade to give our vaulters a sound and reliable platform for the future. As you all appreciate I have to start with our horses first as without them we cannot participate in our sport. A special thanks to those who have looked after our horses during the year and have helped take the load and responsibility from Jane and myself during times when we have had either to concentrate on competing or whilst I have been away participating in our sport in other capacities. OUR LUNGERS and COACHES --- Our horses may be the most important part of our club however a club cannot run without lungers and coaches. A thanks to all who have helped in this area, both to our more mature members and our younger vaulters who are taking on this role. For 2015, we need to set time aside to ensure that assessments and qualifications are awarded to those who actively participate helping our club, whilst in my opinion, also improve themselves by giving their knowledge and experience to younger club members. PARENTS --- Thank you parents becoming involved in helping our club in numerous ways:- sorting costumes for team with a theme, organising of vaulters at competitions, transportation of vaulters to competitions, helping steward at competitions, fundraising and all the other jobs that have to be done to ensure the smooth running of the club. It is the sacrifice and dedication of Wee County members that ensure our vaulters get to participate in our fantastic sport. THE CLUB VAULTERS --- We have had another great year all round. Our vaulters have been producing personal bests at GB competitions. We are still the only club in Great Britain to have achieved International Championship success, adding another two medals to our club tally. New challenges await in 2015, for vaulters who are moving into the senior section, for those who are working hard to build on their successes of last year, for those who aspire to meet and improve on the achievements of others within the club. Good luck for 2015 (which actually means lots of hard work and dedication to our sport). the very heavy work load that our CVI put on our small administrative team we did not run any BEV competitions. This year we do intend to run a competition on the 19th of April which will benefit all clubs within BEV, so please assist where you can. As always we have seen some of our members move on to other sports, hobbies and pastimes. I hope that they can look back and enjoy the friendships that they made as part of our club and will always be welcome if they wish to come back to visit. We are now back online after a few website issues and a bit of a failure keeping up to date with everything that's been going in the past year. We had a very successful season 2014 winning two medals at the World Equestrian Games - a Gold in the Senior Individual class and bronze in the Pas de Deux with Joanne, Hannah and John Eccles and W.H.Bentley. Fingers crossed we can keep the momentum going into 2015. The first Scottish competition of the new season took place last weekend at Kingsbarn in Falkirk. With almost all the club members competing, it was a busy day, however thanks to our array of dedicated parents and lungers not only did our vaulters have a great day but the competition ran more smoothly as well. Thank you to all who chipped in. The real successes of the day came from our younger vaulters. The novice team of Abbie Taylor, Rebecca Logan, Sophie Cairney, Jack Wilson, Leah Taylor and Lucy Taylor competed in this class for the first time. Lunged by Hannah Eccles on W.H.Bentley they achieved a fantastic second place. In the walk section Claire Logan won the individual class with Sophie Wilson second and Mhairi Hume 6th. Erin Clarke placed 3rd in her class. There were many successes from our more advanced vaulters, in the senior individual Joanne Eccles placed first, closely followed by Hannah Eccles and Helen Anderson. Joanne and Hannah won the pairs class and the S.E.V.T. vaulters won their team class. In the individual classes our vaulters experienced some unexpected problems, however still managed very respectable results. We are now looking forward to Saumur where Rebecca Norval, Andrew McLachlan, Helen Anderson, Hannah Eccles and Joanne Eccles will all compete as individuals. After competing at the master class in Paris and in Salzburg, both at the beginning of December, both Joanne and Hannah Eccles qualified for the World Cup final, which took place in Bordeaux this weekend. Only the top 6 vaulters in the world were there to compete and we were proud to have both our girls there to represent GB. A fantastic first round left Hannah in 3rd place and Joanne in the lead, with all to play for in the final. Both girls put in a brilliant second performance and finished the competition with Joanne winning the World Cup and Hannah in second. The girls competed on W.H.Bentley, lunged by John Eccles. After a Rollercoaster weekend at the British Championships at Bishop Burton college, Wee County brought home some fantasic trophies and great results. W.H.Bentley, Baroque, Tylers Kernel and W.V.C. Anton all became British Champion horses. Many thanks to all who helped out over the weekend and in training throughout the year. Pairs Champions: Hannah and Joanne Eccles with John Eccles and W.H. Bentley. A link to the full results will be posted soon. Congratulations to everyone, what a great season. Bring on the winter training. Wee County had a very successful Scottish Championships. Many thanks to all involved. Wee county vaulters have again had another very busy season this year. Unfortunately that has led to not enough website updates!! Competing in Saumur, Ermelo, Belgium, Wiesbaden, Aachen and at the European Championships, Wee County have a lot to be proud of. So far this year Andrew McLachlan, Hannah Young and Georgia Cox have made their international debut's as individual, whilst as part of the S.E.V.T. Victoria Campbell, Emma Biggerstaff, Leigh Taylor and Lisa Mercer all attended their first CVI and Championships. Hannah Eccles won her first CVI** at the masters in Wiesbaden, Germany. The international year concluded with the Championships in Le Mans, France. Joanne Eccles fought hard to retain her European Championship title, whilst Joanne and Hannah together missed out on the pairs gold by 0.002, and so took the silver medal. Andrew McLachlan was the highest placed junior male, placing 13th, and seven Wee County members, as part of S.E.V.T. placed 8th in the junior team class. The Scottish and British Championships will conclude this season, fingers crossed all our vaulters will be able to put their best foot forward, and have a ball. Full Results coming soon. Congratulations to all, and a big thanks to all the parents who helped at the competition and especially to Anne Young, Amanda McLachlan, Jackie Taylor and John Eccles for lunging W.H.Bentley, Tylers Kernel, Baroque and W.V.C. Anton. Joanne and John Eccles have become World Champions at the World Equestrian Games in Kentucky. Hannah Eccles finnished in 16th place. It has beeen a very busy season for Wee County, which is unfortunatley the reason for the lack of news. The Junior European championships resulted in a silver medal for Pas de Deux Joanne Eccles and Hannah Eccles, the first for Great Britain. Brogan Moffat came top British Female gaining 16th place, only just missing out on second round. Helen Anderson gained a personal best score in the CVI** class scoring 6.997. Seven of our vaulters also formed the Scottish Equestrian Vaulting Team and came 6th place, in difficult circumstances. The Scottish Equestrian Vaulting Championships were held at Rowallan Activity Centre, Fenwick on Saturday 4th September. Wee County Vaulters participated in several of the classes achieving podium places in all the classes they entered. Joanne Eccles retained the senior female Individual title with Hannah Eccles taking second place. The sisters also won the Pas de Deux class vaulting both times on W.H.Bentley lunged by John Eccles. In the Junior Individual class Helen Anderson was placed third with Brogan Moffat 4th both vaulting on Tylers Kernel lunged by Amanda McLachlan. Andrew McLachlan became the Under 14 Champion with Hannah Young 3rd in this class vaulting on Baroque lunged by Jackie Taylor. In the Pre Novice Team Competition the Wee County team was placed 2nd vaulting on W.H.Bentley lunged by Anne Young. The team consisted of Lisa Mercer, Sophie Cairney, Ewan Young, Georgina Mountford, Abbie Taylor and Jack Wilson. The Wee County Intermediate team, vaulting on Baroque, was placed third in the Intermediate Team competition. The team consisted of Victoria Campbell, Emma Biggerstaff, Joanna Wilson, Georgia Cox, Leigh Taylor, Hannah Eccles and Helena Wilson. This class was won by the Scottish Equestrian Vaulting team which included seven Wee County Vaulters, Andrew McLachlan, Hannah Young, Cassie McIlwraith, Yasmin Williamson, Rebecca Norval, Harry Cox and Joanne Eccles vaulting on Tylers Kernel lunged by Amanda McLachlan. The final success of the day was when W.H.Bentley received the prize for the best Individual horse. 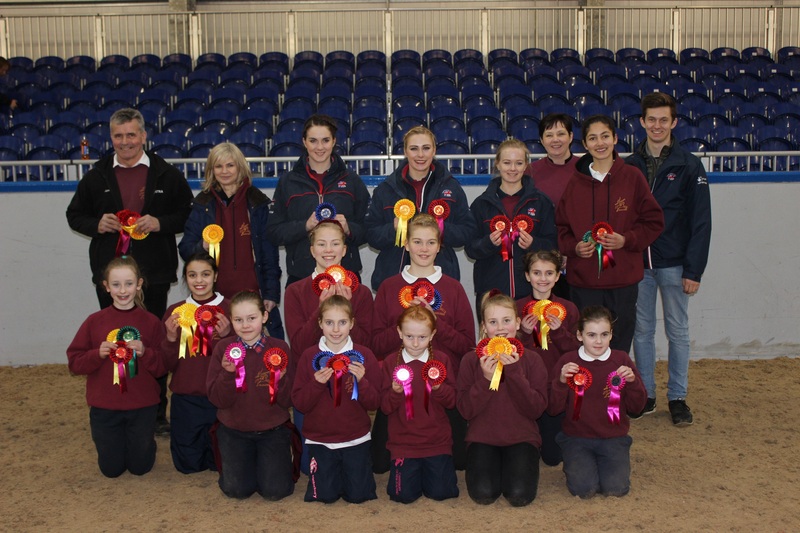 The first Scottish competition took place at the weekend at the Scottish National Equestrian Centre. As well as organising the event Wee County Vaulters took 27 vaulters, 4 horses, and 4 lungers. Joanne Eccles was placed first in the senior individual class, with Hannah second. The girls also won the pairs class. Andrew McLachlan won the under 14 class with Harry Cox in fourth, Yasmin Williamson won the Junior non-selection class, with Cassie McIlwraith second. In the Junior selection class Brogan Moffat was 3rd with Helen Anderson 7th and Georgia Cox 8th. In the team class the Scottish Equestrian Vaulting Team made up principally of Wee County Vaulters, were a close second whilst Wee County's intermediate team won their class, and the pre-novice team were third. Sophie Cairney and Lisa Mercer were 3rd in the walk pairs class. For full results see the link on the results page. Many thanks to all our judges and helpers without whom the day could not have run as smoothly as it did. Last weekend saw Joanne Eccles, Hannah Eccles and Brogan Moffat compete in the CVI*/** in Ermelo, NED. Brogan made her debut on the International circuit competing on Tylers Kernel, lunged by John Eccles and achieving a very creditable 6th place in the Junior class. Tylers Kernel also took a Canadian vaulter in the CVI** class, Jeanine van der Sluijs. Joanne Eccles won the CVI for the 3rd year in a row with sister Hannah in 5th place. Today the Wee County Vaulters were out in force demonstrating at the Glasgow Vet School 50th Annual Rodeo. With 15 vaulters, 4 horses and 4 lungers it was a great day out, with some money raised for the team by their parents and the tombola stall. Wee County have just returned from the CVI in Saumur France. Due to the competition being a CVI** only, Joanne and Hannah were the only vaulters from the club who competed. They vaulted on W.H.Bentley lunged by John Eccles. W.V.C.Anton also made his International debut competing with a Russian individual Svetlana Samokhvalova. Joanne won the Female CVI with Hannah close behind in 4th place. Together Joanne and Hannah teamed up with the South of Scotland Select vaulters to win the Nations Cup event. Wee County Vaulters are holding the first junior selection trial on the 2nd May at SNEC, Oatridge. For more information and the schedule visit vaulting.org.uk. Joanne Eccles will be running the Alloa half marathon on the 21st March to raise money for flying a horse to the World Equestrian Games Kentucky 2010. Please donate now using our button on the homepage. Unfortunately the competition on the 20th of March at Eagles has been postponed due to snow. It will be rescheduled for later in the year. Wee county were planning on taking a pre-novice team, novice team and many individuals. Last weekend Wee County Vaulters had a fantastic day of competition at the Scottish Championships at SNEC, Oatridge. Joanne Eccles came first in the Female Senior class, with Hannah Eccles winning the junior class. The pair then won the pairs class on W.H.Bentley lunged by John Eccles. Andrew McLachlan was second in the Under 14 class on Tylers Kernel lunged by Amanda Mclachlan. The Intermediate team also won their class. For the first time ever Wee County Vaulters won the pre-novice team class on Baroque lunged by Jackie Taylor. In the walk pairs Lisa Mercer and Sophie Cairney were placed second with Emma Biggerstaff and Amy Gullen 3rd. WCV Anton won the prize for the most improved horse. Wee County Vaulters also gained top 10 places in may of the individual classes. Full results will be posted soon. Many thanks to all the parents and helpers who contributed to the success of the day. Wee County Vaulters recently had another successful outing at the British Championships, warwicksire. Joanne Eccles won the senior female title for the 5th time and Hannah Eccles retained her junior title. Yasmin Williamson was a very creditable 7th in the junior class. In the under 14 class Andrew McLachlan was placed 3rd with Hannah Young 7th, Rebecca Norval 11th, Cassie McIlwraith 12th and Amy Gullen 15th. Both Tyke and Anton took individuals and gained very good scores. Joanne and Hannah also won the pairs title again for the 7th consecutive year, with a very impressive freestyle. To top off the weekend Henry was crowed best team horse, with S.E.V.T winning the intermediate team class. Congratulations to all, including Amanda and John, who lunged for Tyke and Anton and Henry. The Junior and Senior European Championships took place in Sweden from the 27th July to the 4th August. Joanne Eccles was representing Great Britain in the senior individual female class with Hannah in the junior class. 7 members of Wee County also made up the Scottish Equestrian Vaulting Team which represented Great Britain as the junior team. There were some fantastic results with Joanne Eccles winning Great Britain's first ever medal - Gold! Hannah Eccles was an amazing 7th, and the junior team were placed 5th. Joanne and Hannah travelled out to Kentucky with John and Jane Eccles to the American Championships in Kentucky - from the 6th to the 15th of July. As well as being a fantastic competition they got a sneak preview of the brand new indoor arena which will be used for the World Equestrian Games next year. The girls were very lucky to get to compete on Espior, lunged by Nicole d'Auriol (Blue Star Vaulters - America). He went very well and Joanne won both rounds. Hannah was placed 11th. They are very grateful to the AVA for allowingthem to compete at the championships. Link to the news article - click here. Joanne, Hannah and John Eccles travelled out to the CHIO at Aachen along with W.H.Bentley and Anton. Joanne eon the female class with Hannah coming a very impressive 7th in the senior class. Phillip Beasley (Shieldbank) also competed on W.H.Bentley coming 13th. Joanne joined Phillip and E.V.S in the nations cup and were placed 5th whilst Hannah joined Ross Foreman (Lauderdale) and SSS as part of Great Britain 2 and were placed 7th. Wee County teamed up with S.E.V.T and E.V.S to have a joint team training before the Europeans in Sweden. It was held at Balhearty and enjoyed by everyone. Amanda and Joanne also achieved their level 2 coaching certificate, and Hannah achieved her level 1. Thanks also to Julie Newel, Debbie Hunter and John Eccles for coaching all weekend, and Jim and Anne Young for allowing us all to Hannahs 12th Birthday party. Thanks to the website Horse Hero, you can now watch videos of Wee County Vaulters from our own homepage. John and Joanne attended the Master class at Wiesbaden last weekend. After driving Henry to the competition in Germany they competed in two rounds of freestyle - leading both rounds. Joanne won ahead of competitiors from France, Germany and the Netherlands. For full results click here. New photos courtesy of Andreas Heine. 24.05.09 - British Selection Announced! British Equestrian Vaulting (BEV) has selected the teams and individual vaulters for the European Vaulting Championships. Twenty-one vaulters  seven senior team members, eight junior team members three senior individual female and three junior individual females  will attend the championships, which will be hosted by Malm� Ridklubb and will be held at Flyinge Kungsg�rd in Sweden between July 29 and August 2. The Selected British Junior Team. I am delighted to welcome these vaulters to the British Vaulting Team, said Lucy Bell, Chef dequipe BEV. The squad this year is very strong competitively, following multiple international podium finishes this year. It is a very exciting time in British Vaulting with high level seasoned contenders looking for top placings, along with up and coming new talent being selected. It is customary in vaulting for the junior and senior Great British representative squads to be selected from home Country teams and for the first time since 1996, the senior Great Britain team will be made up of an all English Vaulting team following three rounds of selection. The team will be vaulting on Go for Gold, a mare owned by team coach Julie Newell. Go for Gold represented GBR at the World Equestrian Games in 2006 and World Championships in 2008 (with individual competitors). She also won Best team horse at the British Championships in 2008. Senior coach and lunger, Julie Newell added: I am delighted for the girls; they have all been working very hard for the past two years to be selected as Team GBR. I am extremely proud of them and really excited about the challenge ahead of us. Wee County started this year well competing at the first selection trial at Solihull. Joanne Eccles came out top in the senior class, with Hannah Eccles first in the juniors. Joscelin Craig and Helen Anderson also put in creditable performances in the junior individual class. The S.E.V.T. made up of many Wee County Vaulters made it to first place in the junior class. The second competition of the season was in Scotland at the Scottish National Equestrian Centre. Anton had his first outing competing in the individual classes with Joanne and Hannah, and coming first in the pairs class. We entered a pre-novice team on Baroque who were placed 4th and a Novice team on Tylers Kernel who came 3rd. This was Tyke's first team competition and he achieved his team scores for competing abroad. Andrew McLachlan came 1st in the Under14 individual class. Wee County had 10 vaulters travel to the CVI** in Saumur at Easter. Josclein Craig competed for the first time individually on the continent, she competed well on Tyke as it was his first competition aswell. Joanne Eccles won the senior individual class on W.H.Bentley, and Hannah Eccles came 2nd in the Junior individual class. The junior team S.E.V.T made up mainly of Wee County Vaulters narrowly won the junior class at the CVI** - the first podium place for many of the team. All classes were lunged by John Eccles. The second CVI** of the year was in Ermelo, the Netherlands. John took Henry, Joanne and Hannah as well as two dutch vaulters Nicky Bosman and Claire De Ridder and a danish girl Rikke Lauman. Joanne and Hannah both retained their winning titles from last year. Rikke Lauman was second to Joanne in the senior class with Claire 10th. Nicky Bosman was 17th in the junior class. For full results of all the competitions so far see the results page. John Eccles will be attending the FEI Seminar in Glasgow on the 6,7,8th of February. Wee County training started back for the new season. We will be aiming to take all those up for selection to the 1st selection trial at Solihull on the 7th March. Everyone else will be aiming to compete at Oatridge on the 22nd March. NEW!! Other News Page! click here! The 9th of December was out last club night before Christmas. We had a mini-competition for all our novice and pre-novice vaulters. In the over 12 category Pamela Elder came first, 9-12 was won by Sophie Cairney and under 9 by Olivia Mears, all performing lovely freestyles. We wish eveyone a Merry Christmas and hope to see you all when we start back on the 6th of January. The junior and senior vaulters continued training until the 21st of December! They of course also had to have a walk individual competition! In the 12 and under class Amy Gullen was first, with Cassie McIlwraith winning the 13-15 category, and Joanne Eccles winning the over 16 class. To end the season Joanne was invited to compete at the masters in Paris. Hannah recieved a late invite and competed aswell. After two rounds of freestyle Joanne came first with Hannah 5th, both competing on W.H.Bentley, lunged by John Eccles. The British and Scottish Equestrian Vaulting Championships were held last weekend. The competition which attracted clubs from throughout Great Britain was held at the Scottish National Equestrian Centre, Ecclesmachen. Joanne and Hannah Eccles retained their pairs' championship title for a record 6th year in succession. Both girls also won Individual Championship titles with Joanne taking the senior individual title for the 4th time and Hannah winning the inaugural 14-18 Junior Individual title. Both girls competed on W.H.Bentley, lunged by John Eccles. The Wee County Vaulters' Intermediate team competing on Baroque won the Intermediate Championship class. The team which earlier this year represented G.B. at the Junior European Equestrian Vaulting Championships consisted of Yasmin Williamson, Joscelin Craig, Andrew McLachlan, Helen Anderson, Brogan Moffat, Rebecca Norval and Cassie McIlwraith. Brogan and Cassie also competed in Individual advanced classes for the first time and put in very creditable performances on the clubs novice horse Tylers Kernel. In the strongly contested Pre-novice class the team of Becky Stevens, Pamela Elder, Amy Gullen, Victoria Campbell, Leigh Taylor and Olivia Mears were placed 4th. Pamela and Becky were placed 1st and 2nd in the over 14 walk individual class with Victoria taking 3rd place in the 9-12 class. The intermediate team along withHannah Young finnished off a very successful competition by winning the open fun walk class with their rendition of fame. Club has now been back for three weeks and we are delighted that so many of our keen members have returned for another season. We are now working towards the British Championships at SNEC on October the 4th and 5th. Members of the Wee County Vaulters have returned from the World Equestrian Vaulting and European Junior Equestrian Vaulting Championships in Brno securing top 10 places in all the classes in which they competed. The Championships attracted entrants from 25 nations. The Wee County Vaulters Junior team which was the first junior club team to be selected to represent GB exceeded expectations by finishing in sixth place, competing on W.H.Bentley lunged by John Eccles who also coached the team with assistance from Joanne and Hannah. The team which was only formed in March, consisted of: Andrew McLachlan, Helen Anderson, Yasmin Williamson, Joscelin Craig, Brogan Moffat, Rebecca Norval and Cassie McIlwraith. Only Andrew had ever competed outside Britain prior to the Championships, which made the result even more amazing. W.H.Bentley achieved the highest horse score in the Junior team competition. Thirty-three of the top junior female individuals from throughout Europe took part in a strongly contested female individual class. Hannah Eccles also vaulting on W.H.Bentley was one of the three selected to represent GB. Hannah was placed 8th in the competition gaining personal best scores in the compulsory exercises and achieved the highest GB placing in this class. Wee County Vaulters were also represented in the World Championships Senior Female class by GB's top ranked vaulter Joanne Eccles. Once again Joanne competed on W.H.Bentley. Having achieved a personal best in the compulsory test Joanne progressed to the second round in seventh position. Only the top 15 of the 45 individual senior females from around the world qualified for the second round. Joanne then achieved personal best in the Technical test and then proceeded to enthral the audience with her freestyle (to the theme of "Lady in red") this saw her move up two places to finish in fifth position, the highest placing gained to date by a GB vaulter. Thanks must go to all the people who gave financial support to the Wee County Vaulters including Clackmannanshire Sports Council and Benstons Motor Engineers, who's generous contributions helped pay for the horse transportation costs , to allow the club to compete at this prestigious competition. 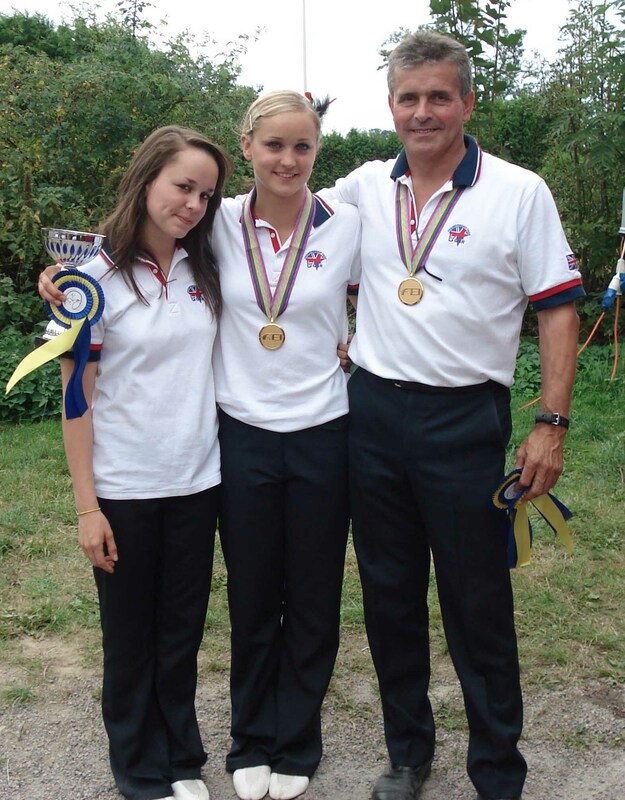 Wee County Vaulters have just returned from a very successful trip to the Czech Republic. 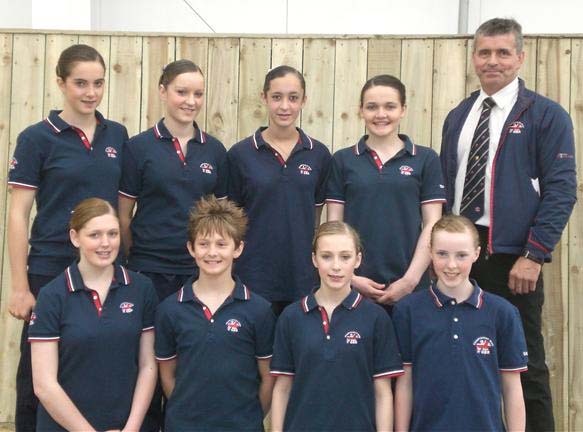 We had a Junior team, Hannah and Joanne Eccles representing Great Britain at the Championships. The team finnished 6th, whilst Hannah was 8th in the Junior Individual class and Joanne was 5th in the Senior class. Congratulations to all and thanks to the horses and all the parents for all their help and support! The second selection trial for the World and European Championships took place in Wrexham, Wales on the 31st May-1st June. All the Wee County Vaulters did incredibly well, with Joanne Eccles winning the Senior individual class, Hannah Eccles winning the Junior individual class and the Junior team winning their class aswell. Other sucesses from the weekend included a 1st in the fun walk class for Wee County's St Trinnians routine, a 1st in pairs for Joanne and Hannah Eccles, 1st and 2nd in Junior non-selection individual for Joscelin Craig and Helen Anderson respectivley, 4th in Senior non-selection for Karen Hewitt, 3rd Under 14 for Andrew McLachlan, with great performances from Yasmin Williamson and Rebecca Norval aswell. Last weekend the official selection meeting took place, and Wee County found out that the Junior team had been selected, and Hannah Eccles had been selected as a Junior individual to represent Great Britain at the European Championships in Brno. Joanne Eccles has been selected to represent Great Britain as a Senior individual at the World Championships also in Brno. Congratulations to all!! After a month of many competitions Wee County has once again exceeded expectations. This started at the first selection trial at Oatridge at the end of April. Joanne won the senior individual selection class, and Karen Hewitt was 6th in her first canter individual class. In the junior section Hannah Eccles was a close second, with Joscelin Craig and Helen Anderson 5th and 6th respectivley. All our Under 14 individuals did incredibly well, competiting on Tyke at his second competiton they all performed well and Andrew MacLachlan took home the 1st place rossette. However the real stars were the Junior team. After only 6 weeks practice they managed to pull it out of the bag and win the junior class. A fantastic weeekend all round for the affilliated vaulters. Our pre-novice vaulters both did fantastically aswell with the 'St Trinnians' team competitng on Zigourney kindly loaned to us for that class by Helen Rogerson (Scottish Borders Vaulters) ~ Thank you. Everyone did well in their individuals, Leigh and Abbie Taylor won the pairs class with Cassie and Pamela a close second. In the fun team class the Oompa Loompas sweetend the judge to be placed first. Well done to all. The seclection trial was followed by an international in Ermelo, Holland. John, Joanne and Hannah drove out with Henry and Sarah Reid from EVS. It was another great competition, the results were close and only revealled in the prize-giving, but Hannah gave it her all and became the first British individual to ever win a CVI*!!! This result was followed by Sarah Reid gaining her highest place ever coming 10th, and Joanne managed to just beat Katarina Faltin to the top position in the CVI** class. However, as if two firsts for Wee County wasn't enough Henry and John topped it off by winning the best individual horse!! Well done. There were plenty other brits competiting and the Eagles Junior team managed to gain their first 1st place at an international, and Ricky Davis closely missed out on 3rd position in the male class. After a few weeks rest John and Joanne headed out to Germany to compete at the master class at Wiesbaden. Joanne was competing on Nicola Stroeh's horse Lanson. He was very good, and after two interesting rounds Joanne ended up in 5th place. So now Wee County are preparing for the next selection trial at the end of May in Wrexham Wales. At the first competition of the season, held at Oatridge college, Wee County vaulted brilliantly, winning our first pre-novice team ever!! We put out two pre-novice teams, one of which took first place whilst the other came a close third. Our fun individuals also performed well, with Olivia Mears winning the under 9 section, Brogan Moffat winning the 12-14's, and Karen Hewitt won her first ever individual in the over 15 class. In the fun team class Wee County's 'fame' team competiting on W.H.Bentley and lunged by Amanda Maclachlan came 3rd with the 'Cheerleaders' 4th on Baroque lunged by Jackie Taylor. In the under 14 class Andrew Maclachlan was second vaulting on Baroque lunged by Amanda, Yasmin, Kirsty and Rebecca all put in very creditable performances; it was Rebecca's first ever under 14 competition. In the senior individual class Joanne Eccles won with Hannah a close second. New Wee County members Helen Anderson and Joscelin Craig also did very well, after only having 3 weeks to prepare. Tyke (Tylers Kernel) competed for the first time in the individual class lunged by John Eccles, and he took third place with Joanne. Everyone did a fantasic job, especially all the parents who put in such hard work looking after costumes and acting as officials during the competition. Further results on the results page. A great start for the new season. Rebecca Norval competing on Baroque. Wee County had their last training before the holidays on the 11th December and will start back on the 8th of January. We would like to wish everyone a Merry Christmas and a Happy New Year! Four of Wee County's Vaulters along with coach John Eccles have been invited to attend an Elite conference in Birmingham in January. Yasmin Williamson and Andrew McLachlan have been selected to attend as members of the Scottish Equestrian Vaulting Team, Hannah and Joanne Eccles have been selected to attend as individuals. There are approximately 30 vaulters attending the conference from all over Britain. It will include gymnastis and dance as well as nutritional information. For the first time ever Wee County put out two Pre-novice teams at the Scottish Championships on Saturday. The teams, one on Baroque lunged by Amanda McLachlan and the other on W.H.Bentley lunged by Jackie Taylor came 3rd and 4th respectivley. In the Junior Individual class Andrew McLachlan won for the 2nd year running, Yasmin Williamson came 7th and Kirsty Clyde came 17th. In the Female Individual Joanne Eccles came 1st with Hannah Eccles 2nd. Joanne and Hannah also came 1st in the Pairs class. In the fun Individual classes Abbie Taylor came 1st in the under 9 section, Rebecca Norvel won the 9-11 section. For full results see the results page. This was the last competition of the year, competitions re-start in March next year. Four Wee County Vaulters Competed at the British Championships last weekend. The Championships were held at Morton Morrel in Warwickshire. In the Individual Female class Joanne Eccles came first, with her sister Hannah second. They both competed on W.H.Bentley lunged by John Eccles. In the Junior Under 14 class Andrew MacLachlan was 2nd with Yasmin Williamson coming 8th. They were both competing on Baroque lunged by Amanda MacLachlan. In the pairs class, Joanne and Hannah managed to keep their title and became Pairs Champions for the 5th year running. All four vaulters also competed as part of the Scottish team. Joanne and Hannah were in the Advanced team, and Andrew and Yasmin were in the Intermediate team. Both teams came first in their classes! Overall a great sucess for Wee County! Wee County Club training starts back. We are aiming to put out some teams and have everyone doing individuals for the competition on the 20th September. Some of our more advanced vaulters will be going down to the British Championships in England on the 8th and 9th September. Congratulations to all Wee County Vaulters who competed in the European Championships, Hungary. Wee County had 4 members in the senior British Team who competed on Baroque, Joanne Eccles, Hannah Eccles, Hannah Nicol and Harriet Nicol. We also had 2 members in the junior British Squad who came 8th, Andrew McLachlan and Yasmin Williamson. In the Individual class both Joanne and Hannah gained personal best coming 4th and25th respectivley, competing on W.H.Bentley. John Eccles lunged both Joanne and Hannah and the British senior Team. Jane Eccles did a fantastic job as Chef d'Equipe.